Glubble has been release in a version 1. 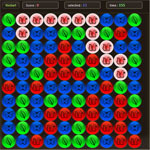 Developed by Alan Sapede, it is the first game in Play WebGL games list. The game is in 2D and will blow your mind. It’s amazing how it can be addictive. Description : You have 3 minutes to reach the highscores. 3 minutes to make the longest lines you can with the same color bubbles. You can play it on the Glubble page.